The detailed artwork is of the Chevrolet Bowtie Badge emblem in Golden Yellow with chrome trim, on a Black background. The word Chevrolet is printed under the badge. 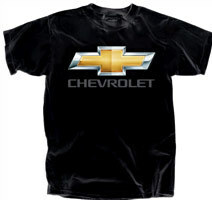 The Chevrolet Bowtie badge emblem artwork is quite large on the front of the Tee. Tee shirt Colour: Available in Black only, complete with genuine GM official licensed product tags.